Coles is a leading national supermarket retailer and operates more than 770 supermarkets throughout Australia. Its history dates as far back as 1914 when the first Coles Variety store opened in Melbourne, Victoria. 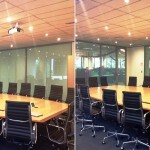 Eight standard switchable privacy glass panels were manufactured for their head office boardroom in Toorak Road, and later glazed into 32mm aluminium glazing channels on site. With the panels now wired in with all the other electrics, the sometimes charged atmosphere of a meeting can now be privately concealed from outside viewing or, in the case of regular meetings, made transparent at the mere flick of a switch.